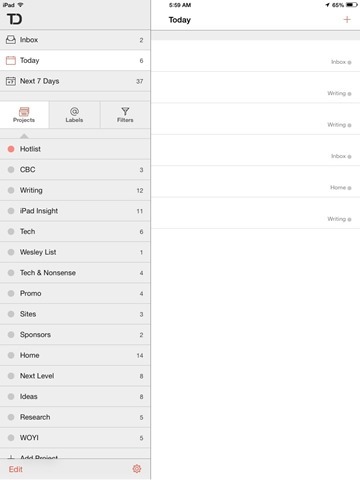 The excellent Todoist to-do app for the iPad and iPhone has been updated for iOS 7 today. Fittingly, the new version number is Todoist 7.0. This update brings a new look that follows iOS 7 design cues, and also Background Sync using iOS 7’s new multitasking capabilities. That’s a big plus, especially for premium users – although I have to say the sync in Todoist was already superb. Vivid, colourful, and streamlined, Todoist now reflects the iOS 7 look. Even when you’re not using it, Todoist quietly syncs tasks across all your devices. Free users get 6 free background syncs during the day, while Premium users get live background sync across all the platforms. I’m a big power user when it comes to to-do / task management apps. I’ve never been a huge calendar user, but I rely heavily on a tasks app every single day to keep life and work on course. So I’ve tried many to-do apps for the iPad and, as I said in my review of Todoist in August, it is simply the best. Here’s an App Store link for Todoist; it’s a free app with an In-App purchase option to upgrade to a premium account, and a universal app for iPad and iPhone.